Is TPD and other sites being blocked to meet quotas? Interesting viewpoint on why certain sites that ordinarily would be left alone are now being added to the censor’s list. If the blogger’s hypothesis is true, this site may be permanently blocked in China no matter what I do. Sigh. All my friends in China know only too well (much too well) how much I love Kunming. As I get ready to leave China in a few weeks, it’s the one place I feel I absolutely must go back to one more time before heading home. I had only one very brief experience in Kunming that I’d have to classify as not entirely delightful, and I always wanted to get it down on “paper.” It was brief, only a few seconds long, actually, but I still think about it. This Jiang Brothers is located on a tricky intersection where some busy streets converge, making it something of an island. There’s only a small spot where taxis can stop directly in front of the front doors, and if you don’t want to get your taxi there you’ll have to cross the street and walk a block or two away. This little space had in effect become a taxi stand; there always seemed to be people waiting there for cabs. So when I was done with my dinner and needed a taxi to get back to my hotel, I waited there, too. A couple of people were waiting ahead of me, and within ten or 15 minutes I was the next in line. Then along came six relatively well-dressed guys, probably in their mid-30s. They looked like typical nouveau riche Chinese, most of them a bit overweight, carrying the small black purses you see so often in Shanghai and Hong Kong and wearing gold rings and watches. And all smoking, of course. I was now the only one waiting up at the front of the informal taxi stand, and they didn’t line up, instead stopping a bit further up the road. What happened next is something we’ve all seen, and something I wrote about way back during my first few months here, namely the every-man-for-himself attitude that is among the first cultural shocks for any newcomer here. (And here I have to say that in Beijing this has improved tremendously over the past few years, and people have gotten much better about honoring lines and letting you out of elevators before they plow in, etc. ) A taxi approached and I hailed it, and the group of young men hailed it too, and instead of pulling up to the front where I was waiting the taxi stopped in front of them and three of the group of six got in. Okay, I’ve been in China for a few years now, so this didn’t faze me at all. Sure, it’s a little irritating, and it might have been nice if they’d said, “This guy was here first,” but it’s definitely not worth fighting about. They had to split up, and now the other three were waiting for their taxi, and I thought that even if they get the next taxi and I have to wait a little longer, so what? And so I waited, and when the next taxi came a couple of minutes later the same thing happened – I hailed it and so did they. Only this time the taxi pulled right to the front and stopped in front of me. As the taxi approached and it was obvious it wasn’t stopping for them, I heard loud grumblings from the Gang of Three about the laowai stealing their taxi. At first I didn’t think much of it. Even if they somehow thought they were next in line for the taxi, this isn’t exactly a place where line etiquette is religiously respected and fervently observed. People often cut lines and do what they can to be first. And I wasn’t cutting. I was next. So when I heard the word laowai being spoken more loudly and more harshly, and when I saw the Gang of Three walking over to me indignantly, clutching their black purses, I began to get a little nervous. But not a bit less determined to stand my ground. I looked at the driver and asked if he wanted me to get out of the car. He said no. And then “the leader” went a bit too far and opened the door to the front seat. He was actually going to start a fight because he wanted the taxi. I truly admired the taxi driver at this point. He simply reached across and grabbed the door handle, slammed it shut, pushed the lock down and shouted something at the group. And then he sped off. He waved my apologies away and said it didn’t matter. As I said, this incident is in no way your typical evening in Kunming. Quite the contrary. The people there are so laid back, so friendly and welcoming – but then, maybe that’s why I found this so unnerving, and why it caught me off guard. Those shouts of “Laowai!” are so vivid, even now, four months later. It took the rest of the night for me to completely shake it off, and it’s definitely “one of those moments” that will be with me as part of my mosaic of China memories. The following is a guest post from my friend Bill Stimson. It has happened now in Iran like it did in Myanmar a short while back. life, this may inflict on others. their hearts with a more sacred truth. whole world knows it too, and sees it also. It’s only a matter of time before the fake structure crumbles. The following is a contributed post by my friend from Taiwan Bill Stimson. exists in so many places besides Iran. us. It isn’t revealed by what we can get, but by what we can give. religions, and cultures — second to none. Every workday I follow the same routine, waiting for bus #115 on Gongtibeilu near the Dongsishitiao subway station, heading east. The bus turns right onto Tuanjiehulu, where I used to live in 2002-3, and then zigzags a bit, letting me off on Jintaiixilu a block north of Guanghualu. Everyday the same. I’m usually able to get a seat when I first board the bus. Then, at Tuanjiehu, a lot of people get off but an even larger number of people get on, many of them older men and women. And I always get up and give my seat to one of them no matter how tired I am, and most of the other pre-arthritis passengers do the same; the Chinese people here are quite good about this (better than Hong Kong), and nearly always give their seat to someone who is obviously more in need of it. One day last week – I forget exactly which day – it was pretty much the same as always. I hadn’t been able to find a seat this time, and I had to stand the whole way. (No big deal, it’s only about 25 minutes.) I was doing what I often did on the bus, clicking through flashcards on the Pleco dictionary on my mobile phone, kicking myself for not remembering characters I thought I’d learned months ago, and basically going into my own world for the length of the ride. I was standing by the exit, smack in the middle of the bus, and wasn’t even noticing where the bus was; by this time I instinctively know when it’s my stop. All of these thoughts of disgust and distaste took place in a fraction of a second. I heard the voice screaming the single word, Xiexie! Xiexie! As the barker inched toward me. I vowed not to turn around. That’s what they want, especially if you’re a laowai – looking at them gives them that window to grab your heart and your wallet. I just listened in annoyance and kept focused on my dictionary. But then the beggar was too close for me to ignore her. Soon she was right alongside of me, still crying out, “Xiexie! Xiexie!” And she then crossed the line, invading my personal space – she shook my arm, forcing me to turn around to tell her to her face to please back off. I stepped back out of their way and let them pass. We had reached Tuanjiehulu. As I stood out of her way I looked into her face and thought I saw several qualities, dignity, determination, gentleness. She never stopped her shouting; it was obvious this was something she had to do wherever they went to keep people out of the boy’s way lest he accidentally hurt them. Yet she was smiling softly, with that “I’m so sorry to inconvenience you” look. She led him by the arm off of the crowded bus and onto the more-crowded street. Even as the bus pulled away to head toward its next stop, I could hear her on the street crying, “Xiexie! Xiexie” as she led him on his way. I stood there crushed, emotionally exhausted, watching the two of them. The woman I thought was an annoying beggar was someone magnificent, someone whose entire life was dedicated to this young man. How many years had she been doing this, I wondered? How much heartache must each day – each step – bring to her? I had only seen a minute of their day, but how many minutes of every day, and how many days of every week and months and years must be like this one? And I kept seeing the Chinese woman’s face all day and all week, full of dignity and kindness, begging people to clear the way because the young man she was leading by the hand couldn’t control his muscles, and I thought…and I thought: How dare I or nearly anyone else ever think that we have problems? How dare we feel sorry for ourselves, for our disappointments, for life not going the way we wanted it to, for the promotion never obtained or the opportunity lost or the money wasted? How dare we? Maybe it’s because I’m preparing to leave Beijing that this incident moved me so deeply. Maybe my own raw emotions made me a little more vulnerable to the grief of everyday life, so much of which is all around us wherever we go, but especially here in China where contrasts are so sharp. Whatever the reason, I can’t get the woman’s voice out of my head, and I wish I could somehow tell her how much I respect and admire her, and how sorry I feel for at first turning a cold and irritated shoulder. I wish too that I could thank her for reminding me of man’s essential goodness, and our ability to put the needs of a loved one above our own. Chances are that she got used to her situation, needing to cry out to others to step out of the way, long, long ago, and what must have been unbearable grief at first is now simply a matter of routine. Still, what she did and what she stands for touched me and reminded me of the noblest aspects of human nature, of how life goes on, and of our ability to absorb and live with unutterable pain. I wish I could tell the woman who I knew was a beggar that to me she was the most exquisite person in the entire universe. I wish I could tell her how much I love her. I have to say, at this moment my loathing of the CCP is approaching 2003 levels. Between the block of my site and the ongoing weakness of the Chinese Internet, which I expect to go on through October, from home it takes a full five to ten minutes for me to get onto my site using a proxy. Then ever 20 minutes or so, the proxy insists on directing my browser to its advertisers’ links, each one taking another eternity to load. It just took me about an hour to put up the last post, more than 20 minutes of which were spent waiting and then dealing with the proxy. My heart really goes out to all the bloggers on the left sidebar like Mark in China, Inside Out China, China Beat and all other blogspot sites. Nothing is as irritating as wanting to communicate with the people you know and not being allowed to do so. The fact that there’s no ostensible reason, that the decision to block seems totally random and irrational – well, that’s just salt rubbed into the wounds. Meanwhile, site traffic is down 50 percent from two weeks ago and I feel like throwing in the towel. That said, I won’t throw in the towel. My plan is to keep posting until the TAM posts drift onto the next page. Then, if the ban continues I have plans in place to move to a new server. If after that they continue to block the site, we’ll know this is somebody’s decision and not just some mindless computer-generated censorship. I try to be fair about censorship here; the truth is, most Chinese are delighted to see all the options the Internet brings them after so many years of isolation and insulation. They see the glass as more than half full. But when it’s you who are being censored, it’s hard to feel objective about the censorship. Whether the Chinese people like it or not, it’s still an insidious form of mind control, and a symbol of the party’s deeply embedded sense of inferiority and helplessness. This morning as I went to work the sky was a yellow-gray with some hints of black, and there was a light drizzle. It was obvious there was a storm on the way, but what happened next amazed the entire city (it seemed nearly everyone was tweeting about it). Suddenly the sky went completely black and the street lights turned on automatically – at 11a.m. 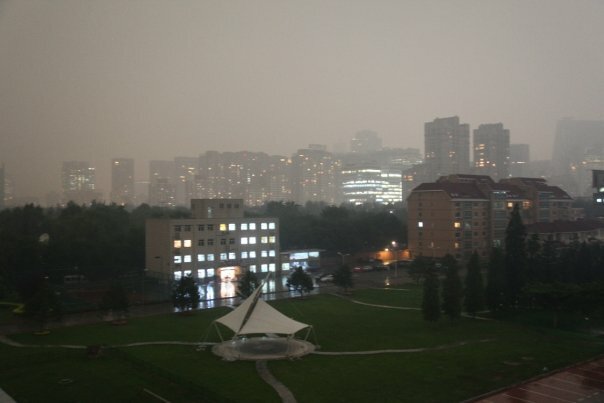 For several minutes Beijing was pounded with rain and lightning and it literally looked like midnight outside. Now we’re back to yellow-gray. Check out these great photos to see what it was like here this morning. One sample. Meanwhile, it looks like there may be a longer-lasting storm over this site, which is still blocked in China, even after switching IP addresses and being told it’s sitting on its own special server. Maybe I simply have to get used to it. I’m hoping that as the TAM posts are pushed off the home page the block will lift. Wishful thinking? A party. And a difficult post to write. Too bad my site is still blocked in China at the moment (even after changing the IP address yesterday), as this is one of those “important” posts. To cut to the chase, after a lot of soul-searching and lengthy conversations with people I love back home, I decided that I have to get my priorities right; I have to leave China and move back to America. I will be leaving China next month. Boy, that was hard to write. When I joined my new company in March, I told them I couldn’t sign the standard one-year contract because I didn’t know how long I would be in China and thought there was a good chance I couldn’t stay a whole year. I had already been in China more than two and a half years, and in Asia for more than four. I knew I would have to return to America at some point, where I have family commitments I can’t ignore. This is not an easy decision. As my friends here in Beijing know, over the past several months, ever since the Olympics ended, I’ve become integrated with the city, it became my home. Before and during the Games, I could have been almost anywhere, because I was working almost constantly, including nights and weekends. That was exciting, but my schedule never allowed me to familiarize myself with Beijing, aside from the narrow strip of road from my apartment house to the office in the CBD and to Haidian, where I did a lot of my work. There is no complaint about that; it was the most exciting work I ever did, even if it didn’t give me much time for exploration. The choice to go back home was not made on the basis of my job or my finances. I still believe China is “the place to be” right now, especially for people striking it out on their own, and that despite their monumental headaches, the Chinese will emerge from the mess faster and less scarred than the US, for whatever that’s worth. In other words from a financial/career perspective I’d probably be better off staying here at the moment. But this decision isn’t based on considerations like that. It’s a lot more personal and has to do more with intangibles like feelings and emotion and love. Having a secure job and most of our needs met is great. But the old cliché still applies: Without love, it doesn’t matter much. I’ll be around several more weeks. I stop working in July and then will ship my stuff and prepare for the big move in just a few weeks. Having done this before, I’m ready for all the reverse culture shock in store – getting used to anchors on CNN who don’t have English accents, seeing a lot more overweight people everywhere, going to the supermarket and not being overwhelmed with the scent of raw fish and durian fruit (in summer), not needing to look both ways for silent-but-deadly electric bikes every time I cross the street, and getting onto any web site I want. Things like that. There’s a lot of mixed feelings and some serious anxiety about facing the US job market at its worst moment, and also some relief. The reason “there’s no place like home” is such a cliché is simply because it’s true. I remember coming home from Singapore half a decade ago and going to sleep the first night in my own bed in my own house, with my cats lying on the foot of the bed. I don’t think I ever felt safer and more comfortable. Now there’s only one cat, and America is a lot different than it was then, but still…. I plan to hold one last dinner before I leave. Not a sit-down dinner like in the past, but more of a cocktail party/buffet so we can all talk without being confined to one seat. Co-blogger and best-friend Lisa will be here on July 7 so that’s the date I’m looking at. The last one, which Jeremiah and I organized, had around 40 people and was quite a night. It was the fifth in what by then had became a kind of tradition. (Go here to see the photo of the very first one, a lunch, and see who you can recognize – too bad the photo’s microscopic.) I’ll post updates on where we’ll go as the day approaches; I’m hoping it will be a place I like near Gulou. I know with all the tweetup and Web 2.0 dinners of late that a “Peking Duck Dinner” may not have the cachet it used to, but it would still be excellent to have one last get-together before I go, especially with Lisa in town. What more to say? Workwise and productivity-wise and learning-wise, it’s been the greatest almost-three years I’ve ever had. Adapting to a new life without the people and the conveniences I’m so used to will be painful (not to say that everything in China is so convenient – just look at how this site is blocked – but some things, like 40-fen bus rides and no need for a car and $4 dinners and sleeper trains and having a maid will be hard to do without). On the other hand, priorities. We have to have our priorities. Even though it’s early and I’ll be saying it again, a lot, thanks to everyone here who was so good to me. It was the complete opposite of 2002 when I first came here, alone and unable to speak a complete sentence in Chinese, when I had no bearings and no friends. It’s so ironic that this blog took off during the last few weeks, as I was getting ready to leave, and when I was most unhappy. For all its randomness and at times frivolousness and cloying mawkishness, it opened up a lot of doors for me here and directly led to some of the most precious friendships of my life. I’m still not sure how I’ll do without them. So many amazing people, the people I worked with the first two years and all the people I’m working with now, and all the friends this site led me to. To say “I’ll miss you” is trite and inadequate. You’ve still got a few more weeks to put up with me. This post is to let everyone know I’m leaving and to invite you to the July 7 party. Please try to be there. And yes, I’ll keep the blog up after I go. Thanks again. this site has been blocked from time to time, but at this point the government realizes that while foreigners here can tolerate youtube and twitter being blocked, going without TPD would be altogether unacceptable. In case one of the 30,000 censors felt offended by my seeming arrogance, let me explain – I was being humorous, ironic, funny. Now, can you lift the block? Adding to the irony, for the entire week prior to the block this site was running June 4 stories non-stop. As soon as I stopped and put up a non-TAM post the ax falls. Go figure. To be fair, it’s possible this is not a block at all but a server issue, though the way it times out, without the usual server error, makes me suspicious. Let’s see how long it lasts. I remember all the jubilation over the past five years whenever the government unblocked Blogspot and later youtube, and each time it turned out they were playing cat and mouse. I’m still not sure about Flickr; I can’t get on it right now but some friends say it’s loading, albeit very, very slowly. Blogspot still seems down as well. Just another nuisance designed to wear people down, something the party is good at. Update: Wow, Bing.com is unblocked again, too. Somebody’s feeling mighty generous today.